We really wanted to visit Maya Bay (The Beach from the film ‘The Beach’), on Phi Phi Leh Island. This is a very popular beach to go to, because of popularity since the film. We knew it was going to be busy so we wanted to find the best way and time to visit. From Phi Phi Don you can go over on a day tour with a ferry or long boat. We didn’t like the thought of going on a big ferry with loads of tourists and being told when to leave. Most of the boat trips only take you to Maya Bay for about 1 hour, unless you take a private taxi boat. The tour or private taxi boat costs about 500 BAHT per person. We decided to read up about Kayaking over to Maya Bay. It didn’t look too far from Phi Phi Don, but this is hard to tell when you are just looking across the sea. We read about a couple of people who had kayaked around Maya Bay, but they used a long boat to get their Kayak there. They mentioned that if you were a strong Kayaker, that you would probably be ok Kayaking back from Maya Bay, to Phi Phi Don. Does Kayaking for one day make me an expert? 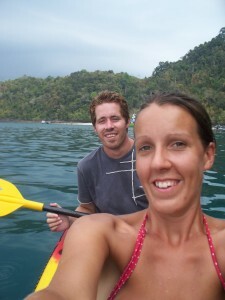 Other than that we didn’t find any mention of kayaking across from Phi Phi Don to Phi Phi Leh. Still we decided to go ahead. So we set out on April 1st 2010 at 10.30am to find a kayak. We went to Ton Sai Bay, as this faces Phi Phi Leh. We rented out our Kayak for the day, for £10. We were given a dry bag to put all our things into. Once we were all set we set off. Everything was going well; we left the safety and calmness of Ton Sai Bay, and headed into the open Indian Ocean, heading towards Phi Phi Leh. We immediately noticed how much rougher the sea was and we could feel the wind starting to pick up. When looking ahead you think the sea looks so calm, but once you have left the shelter of the cliffs and walls, the ocean takes control of you! We needed to use a lot more strength to keep up, as the winds became stronger. Once we hit the corner of Phi Phi Leh, we kept in by the side of the cliffs, but not too close, as we were afraid that the winds could push us up against the rocks. This seemed to be more sheltered. I felt a lot safer now that we were by the side of the Island and out of the open Ocean. Long Boats and big ships kept passing us, with their passengers waving. In fact we saw the same boats passing us again on their way back from Maya Bay, still waving. We kept strong, determined to make it! We finally could see the boats turning, which meant we must be close. As we started to turn into Maya Bay, the waves from the other ships entering pushed us from behind, which gave us a nice break from Kayaking. Arriving at Maya Bay felt amazing. The bay is more beautiful and stunning, as you could imagine! Just block out all the other tourists and big ships and you will be in heaven! We pulled up in our Kayak and people were smiling and starring at our Kayak, pointing at it. They probably thought we were crazy, well they were right! We made though and that’s the main thing! The great thing from now was, we didn’t have to rush off, and we could enjoy the beauty of Maya Bay, for as long as we wanted. So many tourists visit each day, but if you arrive early or after 4pm it does get a lot quieter. We arrived at Maya Bay around 12pm, taking us around 1 ½ hours to Kayak over. It was very busy at this time, but around 3pm it got quieter, allowing us some quite time on the beach! We went walking around the bay for a bit. There is another small bay that you can see if you walk further in land. There is a ladder that we had to climb over, to get to this bay. We noticed a hole in the wall here, which would allow you to push your Kayak through. This is a quick way to the back of the Island. It also may help you leave Maya Bay, if the sea was very rough. There is a small shack that sells drinks and snacks. Be prepared to pay double the price from Main Land. There is also a toilet. If you also want, there are camping trips to Maya Bay. This can be organised from Phi Phi Don. The beach is really heavenly and it is no wander it was chosen for the film ‘The Beach’. The large limestone rocks make a beautiful back drop. If only we could of discovered this beach and kept it for ourselves. We decided to leave Maya Bay around 4.30pm, giving us plenty time to get back before sunset. Just as we left Maya Bay, the winds were very strong, making it more difficult to make head way. Once we got round the bend, it became a little easier. The journey back was a lot harder than the journey to Maya Bay. One thing you can’t control is nature. All you can do is stay calm and do your best to stay on course. We made it back! Taking us around 1 ½ hours to return. We had a fantastic time at Maya Bay, but we were glad to be back on land! The guy who we rented the Kayak from, asked us how our day was. We told him we had kayaked to Maya Bay. He looked shocked and was laughing telling his friends where we had been. Maybe he will use it as a selling point from now on! Kayak to Maya Bay! I guess it is not a popular thing to do, seen as we were the only Kayak on the island! Although this isn’t for everybody and I would certainly not recommend it to anybody who is feeling unsure. It is however possible and takes around 1 ½ hours each way. You would need to be fit and I would recommend you wear a life jacket. If you want to Kayak around Maya Bay, you can also take a Kayak over on a Taxi boat. This would seem like the more sensible option and it still gives you the freedom and time that you may be looking for. Why didn’t we just go with that option? I do not know! It was certainly an adventure! We decided we wanted to take a kayak out and adventure around the island. There are loads of places along the beach, in Loh Dalam Bay where you can hire Kayaks from. We hired ours for 500 BAHT (£!0) for the whole day. We got a 2 persons Kayak. You are also given a water proof bag, to put your camera, money ect into, this then clips onto the Kayak. I haven’t been kayaking for over 6 years, but I soon got the hang of it again. Paul was really keen on taking the kayaks out and I was certainly up for having a go. I enjoyed it very much and would love to take them out again! It is a great way to explore and get away from all the other tourists! We left the bay around 10am and headed to Nui Bay, which is a small cove that has a beautiful beach. This is a great spot for snorkelling as the waters a beautiful and clear. We could see a lot of coral as we arrived. I have never seen sea so clear and blue, except in holiday brochures, which is probaly photoshoped, but this is the real thing! We went swimming here for a while, then decided to go for a walk up through some trees. It looked like it led to somewhere interesting. After walkig for a while through the trees, we could see another beautiful beach. We went back to get our Kayak and decided to go around to it. This was called Loh Lana Bay. This was our favourite spot. No tourists, clear blue water, beautiful soft golden sand, it really did look like paradise! We stopped here for a while and enjoyed swimming in the shallow waters. We then headed over towards Yong Kasem Bay, but a storm started, which made the sea very choppy, so we decided to head back. We had a great day out and really enjoyed relaxing on the other quiter beaches. 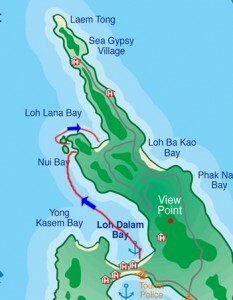 We are planning on exploring around Phi Phi Don Island tommorow. Then on Wednesday we plan on going on a boat trip around the Island. We get gear to go snorkling. We also then go to Phi Phi Ley Island, which is a small island just off this island. This is where ‘The Beach’ was filmed. We will tell you more later:) So far we are really enjoying this Island. It will probaly be hard to pull us away! We arrived on Koh Phi Phi Island at around 3pm Sunday 28th March. The journey over on the ferry was beautiful. We passed a few other tiny little Islands and also lot’s of large lime stone rocks, which look stunning! When we got off the ferry we went to find a hotel. This was not hard to find as they are all along the front when you get off the ferry. The prices range from £10-£80 a night. We finally found a nice hotel, called The Whites hotel. It is very clean and the service is fantastic. We checked in for 3 nights. After showering and settling in, we went for a little walk around, but because we had been travelling for over 24 hours, we decided we should sleep! This was a good idea and we felt much better this morning when we woke up! We left Bali for Thailand on Saturday 27th March. We flew with Air Asia from Bali to Bangkok. Arriving in Bangkok at 3.20pm. We then got a bus from the airport to Hualamphong train station. If you go to the information desk in the arrivals hall, people will direct you to the bus stop. It was the AE4 bus that we had to get to the station. This cost us 150 BAHT each (£3), and took around 45 minutes. We hadn’t booked our transport to Koh Phi Phi Island, we had read on the internet and heard from other travellers that everything was pretty straight forward, so we trusted everythign would be ok.
Well they were right, it couldn’t of been anymore straight forward. We went straight to the ticket desk in the train station and told the man we needed to get to Krabi as soon as possible (this is where you get the ferry to Koh Phi Phi). He told us exactly what we needed to do. We had to get a train to Surat Thani, then a bus to Krabi. We bought a 2nd Class joined train and bus ticket, which cost us 650 BAHT each. Our train left at 7.30pm that evening and arrived in Surat Thani the next morning at 6.30 am. The train was fairly comfortable, but it didn’t have Air/Con just fans, so the windows were left open, which lets a lot of mosquitos in! We would of paid for Air/Con, but they were all sold out. Considering we just got our train ticket on the same day, we didn’t do too bad! When we arrived in Surat Thani the next morning, we had to wait for our bus to Krabi. We thought the bus would take us directly to the ferry port in Krabi, but it doesn’t. First you are taking to a bus station, that is nothing more than a small yard. Here everyone is split up and given different colour stickers, depending on which Island you are going to. We finally got our bus to Krabi 2 hours later. Then we had to get another bus from Krabi, which took us to the ferry port. We got our ferry to Ko Phi Phi at 1.30pm Sunday 28th. It took us 1 1/2 hours on the ferry, which now totals 27 hours of travelling to reach Koh Phi Phi. Was is worth it?